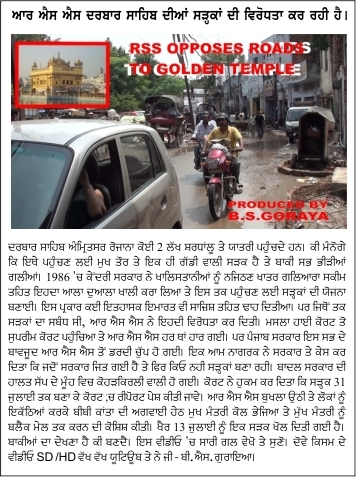 Golden Temple Amritsar, where daily on an average 200 thousand pilgrims and tourists visit has only one vehicular approach road and rest are narrow lanes. In 1986 the Govt of India dubiously planned to have a corridor around the Temple and wide roads to reach it, since it thought the secessionists had an upper hand in the narrow and crowded lanes. Govt did demolish about a thousand structures around temple including historic shops and minor shrines. But the Hindu fanatic organisation felt that the master plan has on the contrary added to the grace and popularity of Temple. It thus endevoured to stop the widening of roads. However the Indian High Courts and even Supreme Court ruled in favour of the Govt plan and ordered widening of roads. Having lost on all fronts the fanatics resorted to blackmail. However on July 13, 2013 the Govt demolished the structures which stood on the way to Temple. This video unmasks the jealousy of the RSS towards Temple.